Potentiometers, or Pots, are simply resistors made with the resistive material exposed, and a wiper riding on it to a third, center, tap. 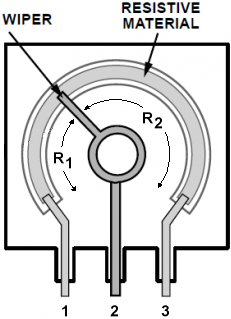 The makes the pot effectivly into two serially connected resistors, with a variable dividing point between them. To use a pot as a single resistor of variable value, simply connect one end, and the wiper. E.g. 1 and 2 in the picture, or 2 and 3, leaving the remaining pin unconnected or "floating". Pots are commonly used as input devices, either to adjust the resistance in a circuit, or to develop a variable voltage... the voltage is made by connecting the ends (pins 1 and 3) to power and ground, and the voltage is then collected on the wiper (pin 2). As the wiper is moved, the voltage on pin 2 will change from ground to full voltage and back. The resistive material can be of consistant value, resulting in a linear change in resistance or it can be made in such a way that the resistance changes expotentially from one end to the other. This logarithmic change is useful for volumn control where small movements at the start should make a large difference in the sound, and changes along with way should have less effect.